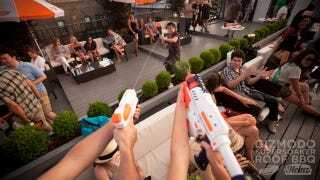 This past Saturday, brave souls flocked to the roof of Gizmodo HQ with a singular mission in mind: to eat, drink, laugh, and fire enormous streams of water at one another at close range. It was a total blast. For many of us, it was probably the first time we'd run around shooting water guns since we were kids—and we felt like we were again! I've never seen so many grown, respectable people grinning like tykes and dripping water from every inch. I was sprayed in the crotch repeatedly, nailed by crossfire from the Hydro Cannon and the Tornado Strike. But that's okay! It was all in the name of good, clean fun. I was also shockingly intoxicated. Many large, soggy thanks to Nerf for the Super Soakers and Heinz for their deliciously convenient ketchup dippers—and of course, everyone who came by. We loved shooting you in the face.